Download a printable quick-reference chart that includes current USPS rates and specifications. 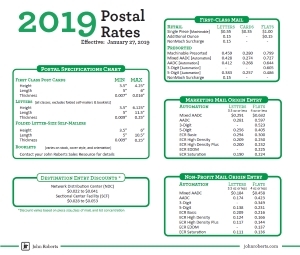 Our printable Postal Rates Chart is THE guide to the current USPS postage rates - download a free PDF copy of the rate chart by simply completing the form to the right. Copyright © 2019 John Roberts, Inc.